A person who has learnt the Vedas and the Upanisads, but has not bothered to study the Puranas, can never be wise, The knowledge of the Puranas supplements that of the Vedas and the Upanisads. 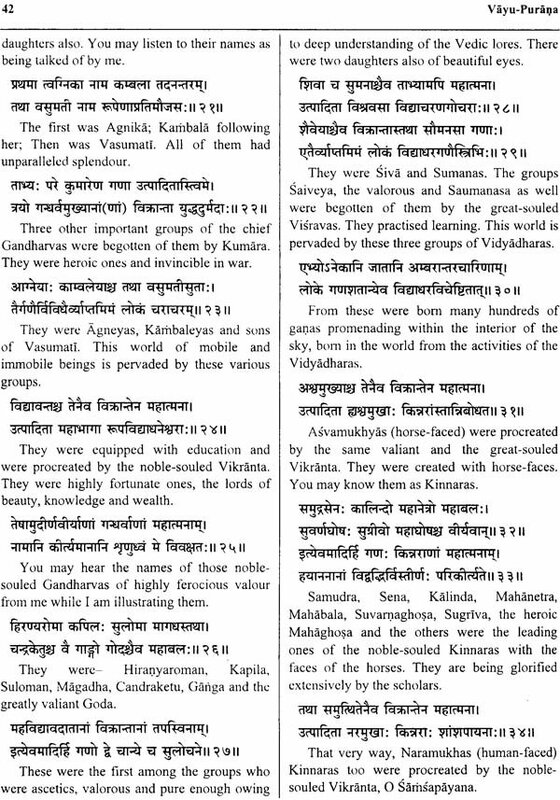 As such, the Puranas contain many stories and history. There is no race on earth that does not have its own history. But the immense volume of the Puranas is unsurpassed anywhere else in the world. 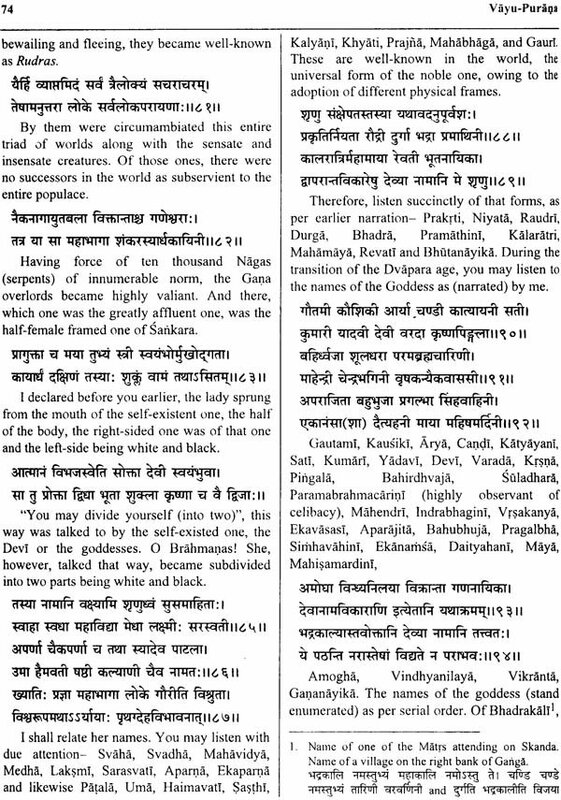 The Vayu Purana itself states that the Puranas were originally recited by the great god Brahma and the one has to understand the Puranas if one is to appreciate the Vedas and the Upanisads. Vayu Purana is so named because it is believed that it was recited by the Wind-god Vayu. 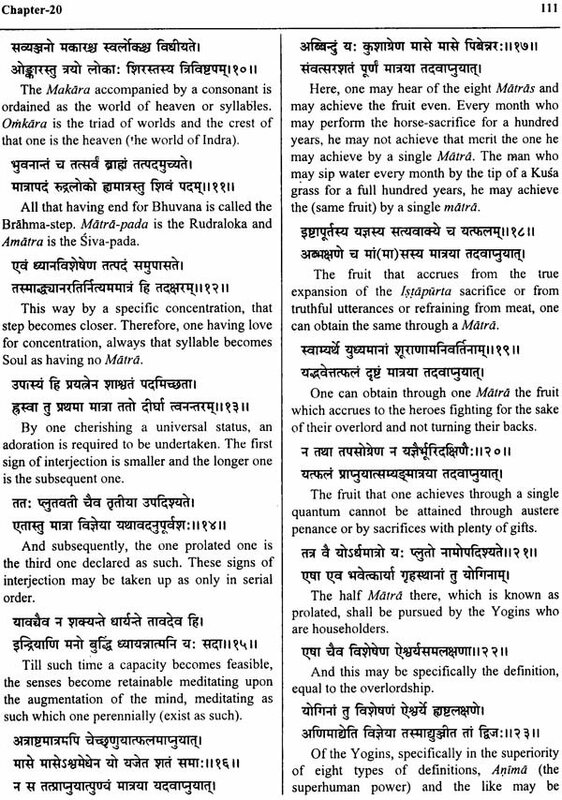 The Vayu Purana has twenty-four thousand Slokas. 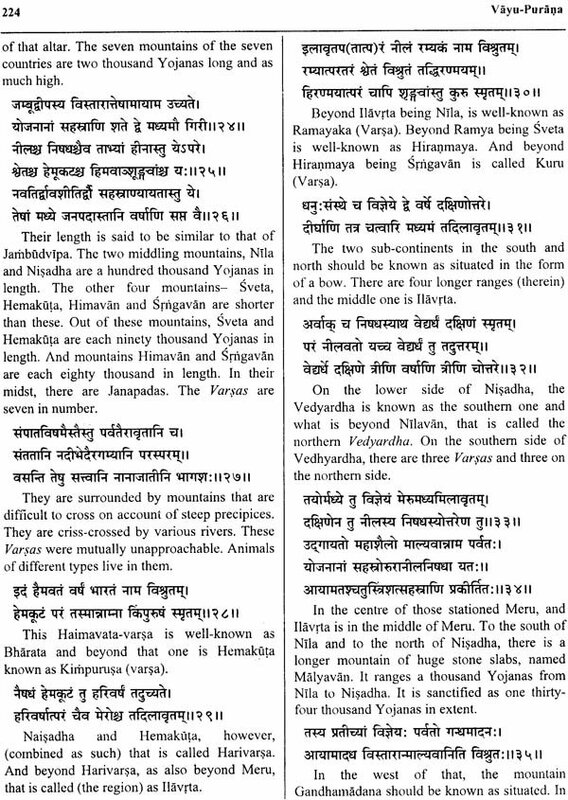 These are divided into two parts (purva-bhaga) and a subsequent part (uttara-bhaga). There are one hundred and twelve chapters (adhyayas) in Vayu Purana. 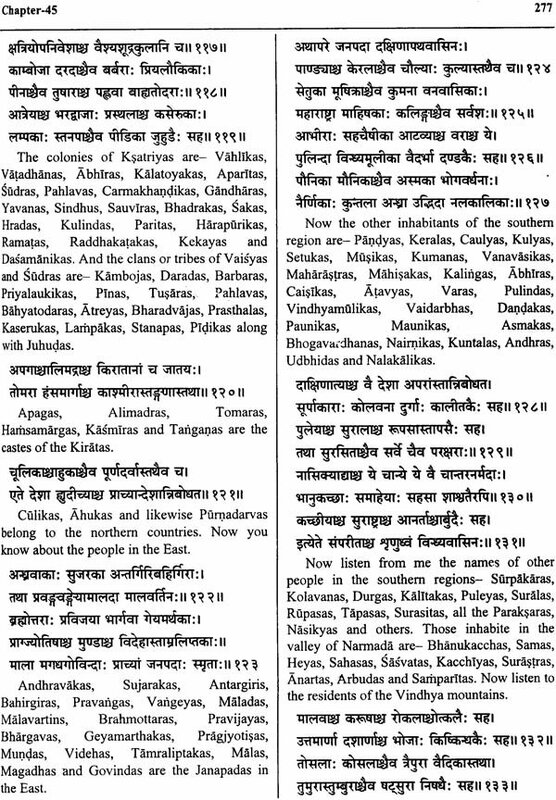 These chapters describe in details about various solar and lunar dynasties, development of Cosmic Egg, birth of progenies, description of various mountains and sacred rivers, duties of four castes and stages of society, measurement and the science of yoga and meditation, enumeration of various king and sages, method of performing Sraddhas and the relative benefits, number of Yugas and sub-continents, the way to ultimate liberation (Moksa) and so on. There are two chapter specifically dedicated to the science of music and Alamkaras. Vayu Purana presents the most comprehensive details of various dynasties, the names of various king, their successors as well as their kingdoms. 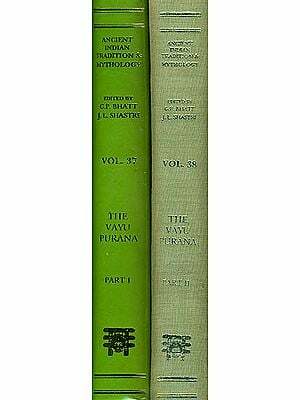 This edition of Vayu Purana in two volumes is the most unique as compared to all other editions published so far from various sources. It includes original Sanskrit text and verse by verse English translation. There is an exhaustive introduction at the beginning of the first volume and an index of all Sanskrit verse at the end of second volume for ready reference of the scholars and readers. 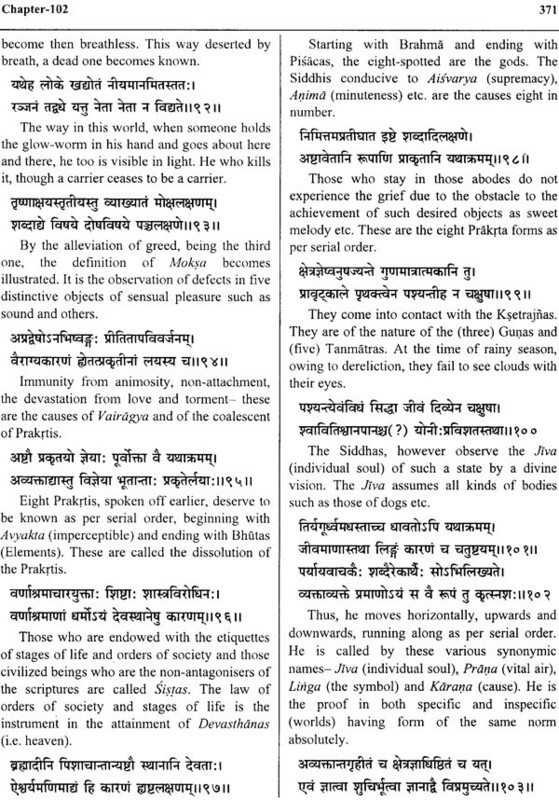 Puranas like Samhitas and Epics form the compendium of fourfold vision of human existence. "Puranam Pancalaksanam is the correct pre-requisite superimposed on them. Every Purana fundamentally deals with topics normally coming within the fold of these five laksana, viz. creation, dissolution and re-creation, genealogy of gods, sages etc., periods called Manvantaras and description of Royal dynasties, but this treatment is quite unique in unraveling the social, political, ethical, linguistic, etymological and allied subjects. This fundamentally forms the basis of Ancient legendary lore and chronicle though anachronism and affords opportunity to make a probe by a comparative study to expose the factual happenings. Indeed, the Purana is a distinct branch of learning. It is treated as one of the Vidyas like the Samkhya and the Vedanta, it has its distinct theory of cosmology. Moreover and beside the five times (Sarga-Pratisarga etc.) mythology is also the special feature of puranas. Cosmology and Mythology, are the two main subjects of Purana-vidya. Just as the Puranic cosmology can be best understood in the light of the knowledge of cosmology of various philosophical systems of India, in the same way that Puranic mythology can best be understood in the light of the knowledge of the comparative mythology. Puranas have contributed significantly in the all round development of human life. They are the symbols of national, social and cultural awareness. They are true inspirational force behind human spirit. They are equally beneficial for both our life in this world and the other worlds (after the death). 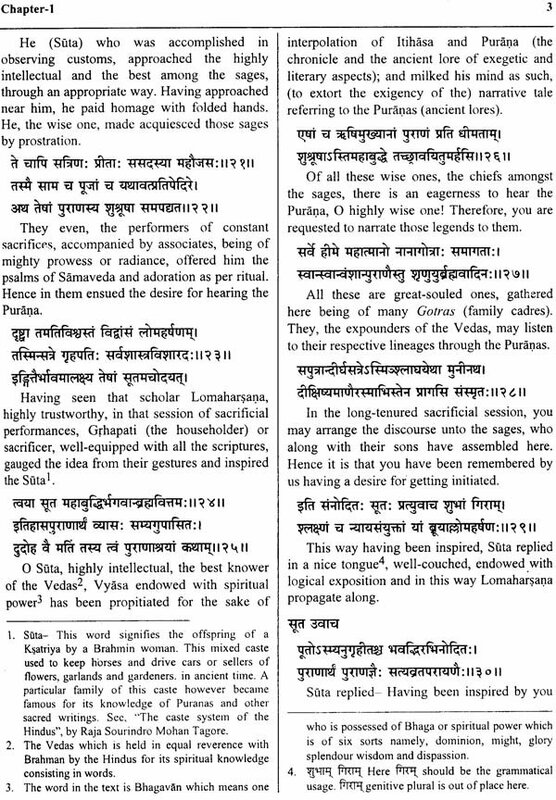 Like Vedas, Srutis, Smrtis, the importance of Puranas has been maintained till date. Since Purana are shadow of Vedas, the deep knowledge of Vedas is very simply and smartly illustrated in the Puranas. The conclusion is the Puranas. The conclusion is that without the study of Puranas, the knowledge of ancient Indian wisdom is incomplete. Of the eighteen Mahapuranas, Vayu or Vayaviya Purana occupies an important place. It is primarily considered as a Siva Purana, but it gives due importance to the other two major deities, viz. Brahman and Visnu. The Vayu Purana is also regarded as the true story of the development of India culture and tradition in various Ages. The Vayu is perhaps the only Purana the existence of which is expressly indicated in the Mahabharata and its supplement the Harivamsa. Instead of emotional aspects like in other Puranas, Vayu Purana is mainly based on concrete facts and calculations. 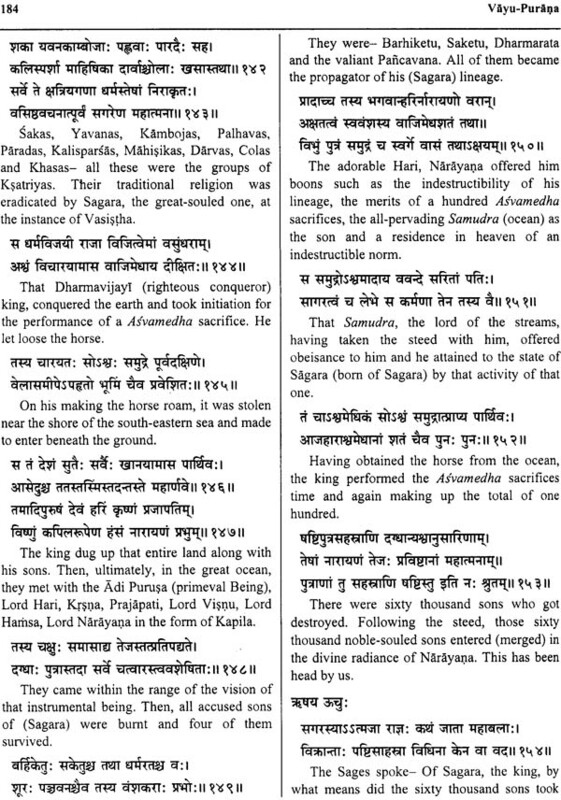 As an illustration, the description of king like Nahusa, Yayati, Tuevasa etc. 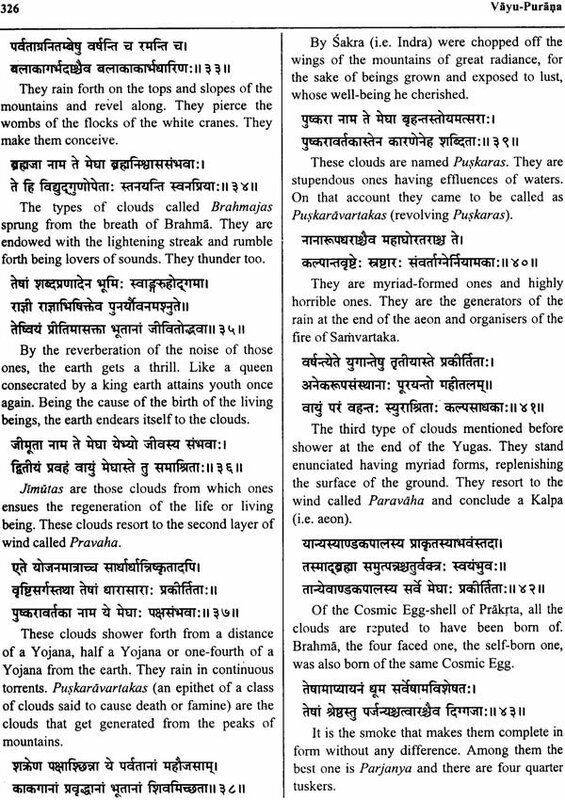 as mentioned in the Vayu Purana, looks more as heavenly bodies when one thinks of the same from a scientific perspective under consideration of Vedic knowledge. 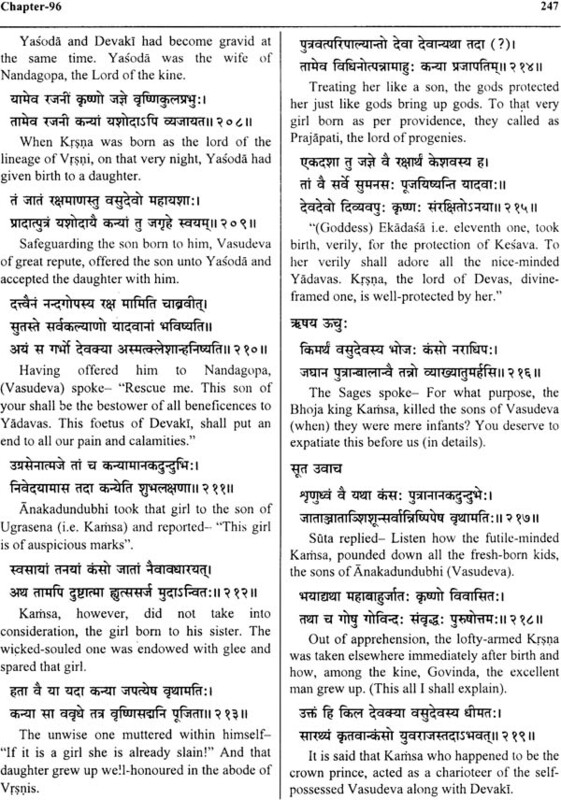 Yayati was the son of Nahusa. His spouse was the daughter of Sukra. His second queen was Sarmisth. Now, when we evaluate them as per Vedic understanding, then, Yayati, the daughter of Sukra and Sarmistha, all proves to be heavenly bodies. The father of Nahusa was Ayu as per Vayu Purana. In Yajurveda (5/2), it is written  "Agne Ayurasi", meaning "O Agni! You are Ayu". The same Ayu has been considered as the son of Urvasi and Pururavas. According to Vedas, Urvasi and Pururavas are the sun and its rays respectively, born of Agni. In the description of Royal dynasties under chapter-99 of Vayu Purana, lord Samsapayana had illustrated the dynasty of Adhisama-Krsna who was the grandson of Janamejaya. His reign is considered usually as being after 200 years of great battle of Mahabharata. According to this conception, the time of Vayo Purana seems to be after two hundred years of Mahabharata period. In addition to this, the composition of Vayu Purana is also an evidence of the same fact. The Vayu Purana itself states that the Puranas were originally recited by the great god Brahma and that one has to understand the Puranas if one is to appreciate the Vedas and the Upanisads. A person who has learnt the Vedas and the Upanisads, but has not bothered to study the puranas, can never be wise. 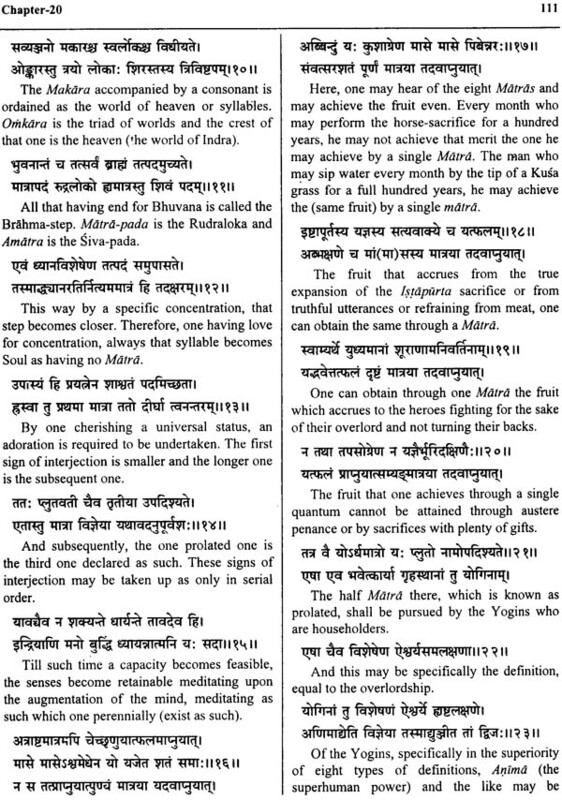 The knowledge of the Puranas supplements that of the Vedas and the Upanisads. 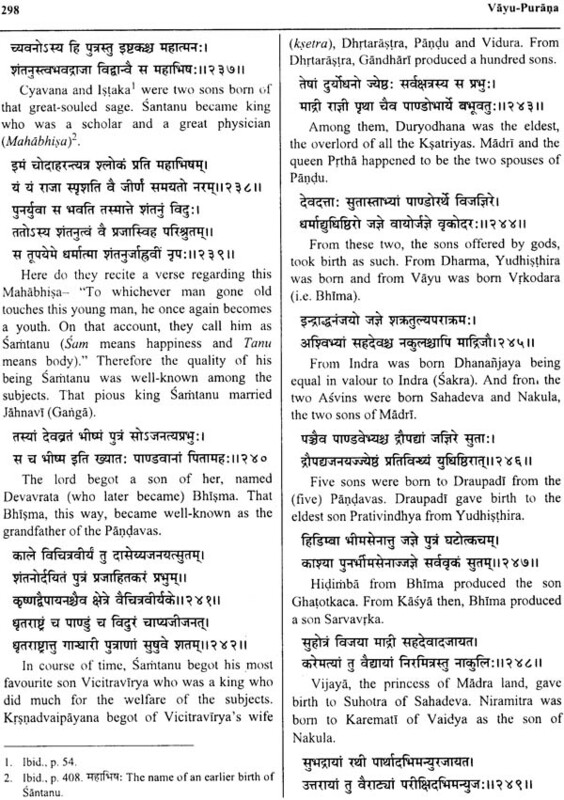 As such, the Puranas contain many stories many stories and history. There is no race on earth that does not have its own history. But the immense volume of the Puranas is unsurpassed anywhere else in the world. How long is the Vayu Purana? As Puranas go. It is about average in length. 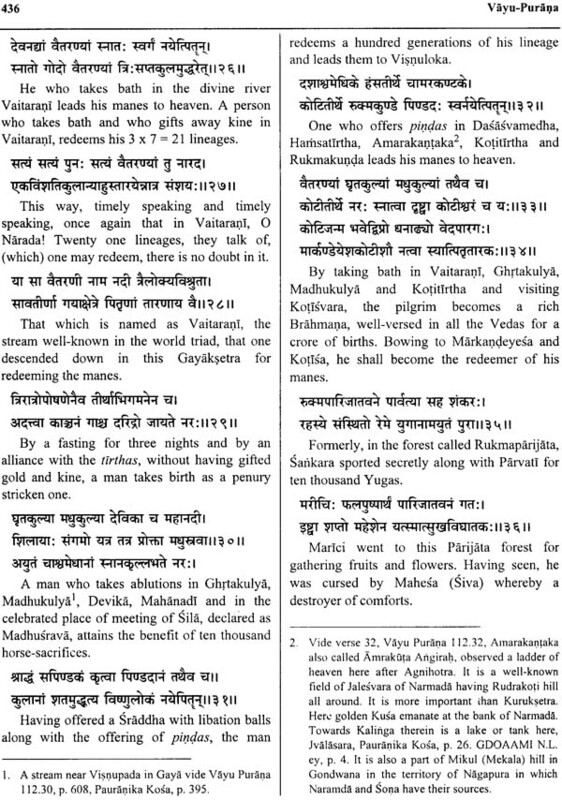 The shortest Mahapurana, the Markandeya Purana, has nine thousand slokas. The Vayu purana has twenty-four thousand. 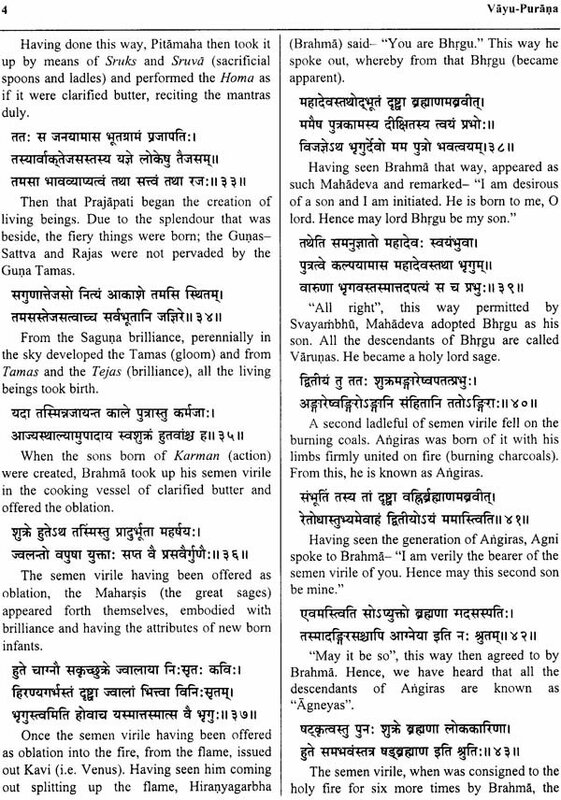 These are divided into two parts (bhaga) a first part (purva bhaga) and a subsequent part (uttara bhaga). There are one hundred and twelve chapters in this Purana. The Vayu Purana gets its name from the Wind-god who is said to be its promulgator. 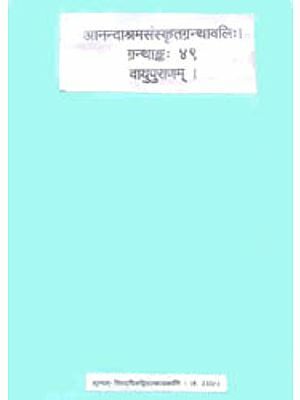 This appears in same lists, under the name of Saiva or Purana, a title which is given to the work because it is dedicated to the worship of god Siva. 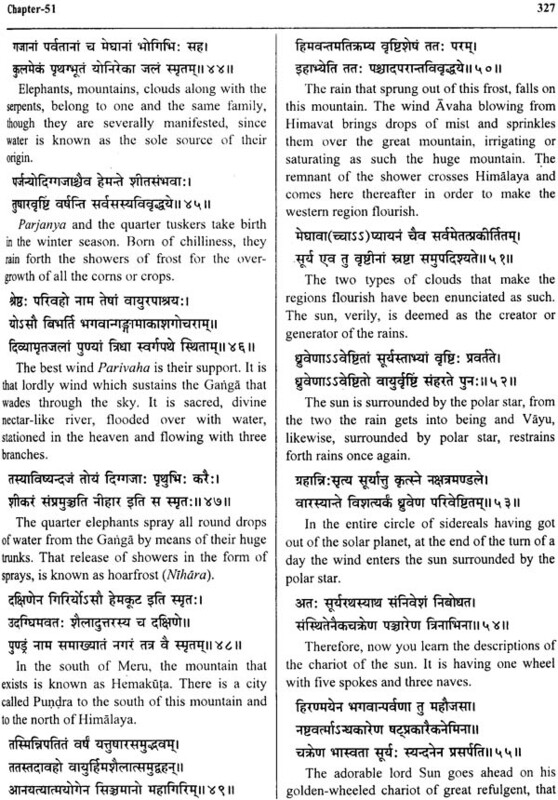 As proclaimed by the Wind-god, Vayu Purana is quoted in the Mahabharata as well as by the Harivamsa Purana. 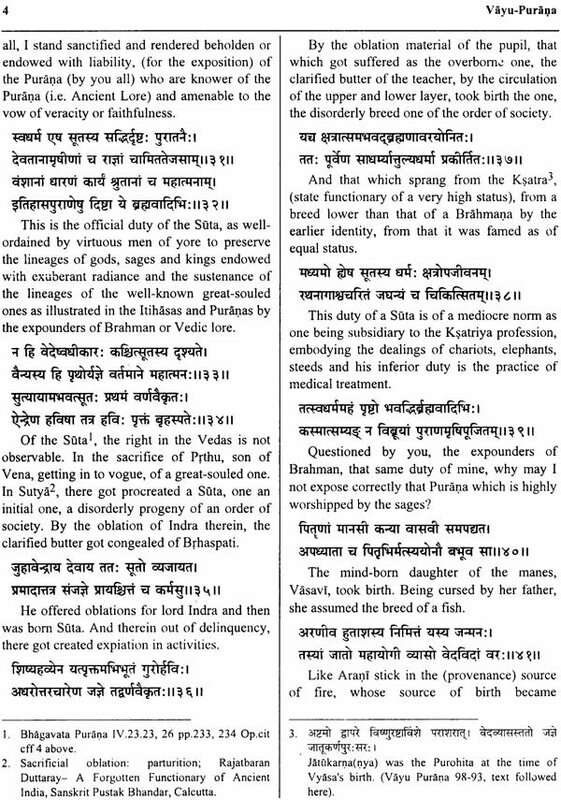 It has already been mentioned that the poet Bana (about 625 A.D.) had read the Vayu Purana and that in this Purana, the rule of the Guptas is described as it was in the 4th century A.D. making the work not later than 5th century A.D.
Legend occurring in Vayu Purana is Siva and not Visnu, as held by Winternitz. But in chapter 109-112, depicting Gaya Mahatmya, we find a great tribute paid to Visnu. According to Vacaspati Gairola- "The expert knowledge of the Puranas was initiated by Brahma himself". Vayu Purana is a true representation of this fact in chapter 103, verse 58. Vayu has been description as expert in grammar (Sabda-sastra). 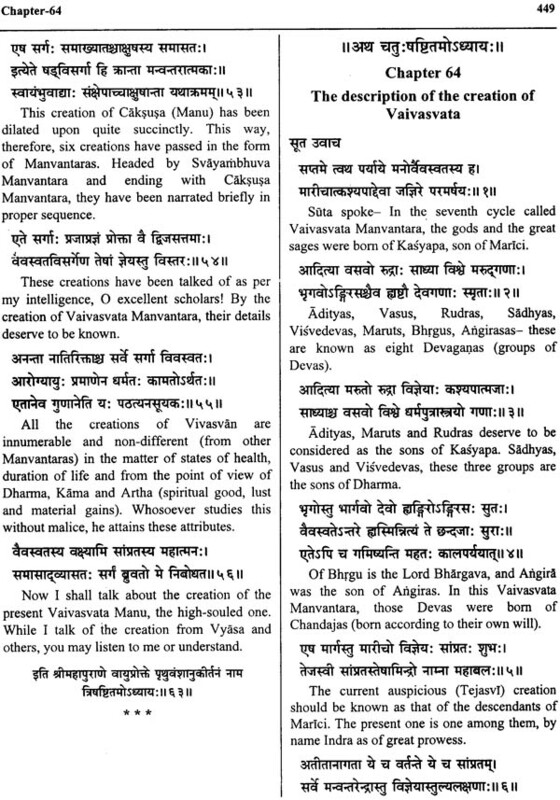 Brahma passed on this Purana to Vayu (Matarisvan) from whom it was received by Usanas who passed it on to Brhaspati who subsequently narrated it to Savitr (Sun). 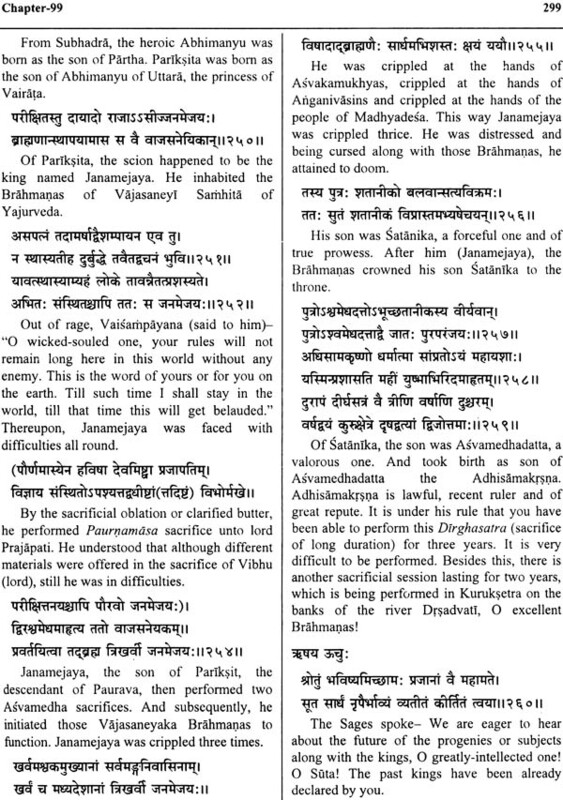 Savitr spoke it to Mrtyu who passed it on to Indra from whom Vasistha learnt it. 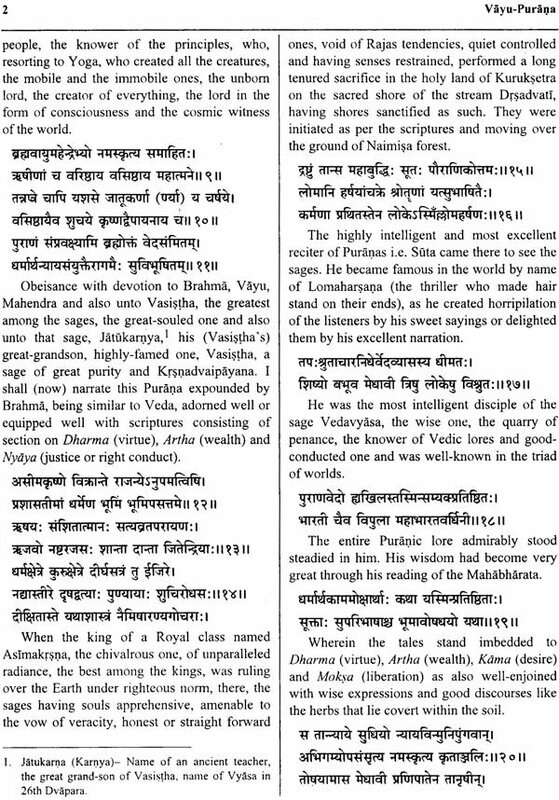 Vasistha even passed it on to Sarasvata. From Sarasvata, it passed on to Tridhaman (the name of the tenth Vyasa of Dvapara Yuga, an incarnation of adorable Bhgru) ; who passed it on to Saradvata; who passed it on to Trivista ; who gave it to Antariksa; who passed it on to Varsin. He even passed it on to Trayyarena. Trayyarena passed it on to Dhananjaya; who passed it on to Krtanjaya, from whom it went over to Trnanjaya; who passed it on to Bharadvaja. Bharadvaja passed it on to Gautama and he too, passed it on to Niryantara. 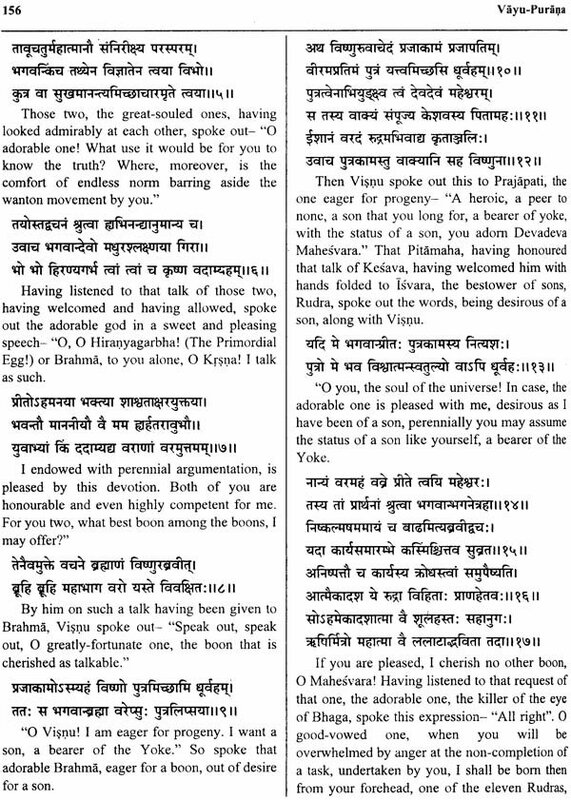 Niryantara spoke it to Vajasrava who gave it to Somasusma. Somasusma passed it on to Trnabindu who passed it on to Sakti. From Sakti it passed on to Parasara staying in the womb. 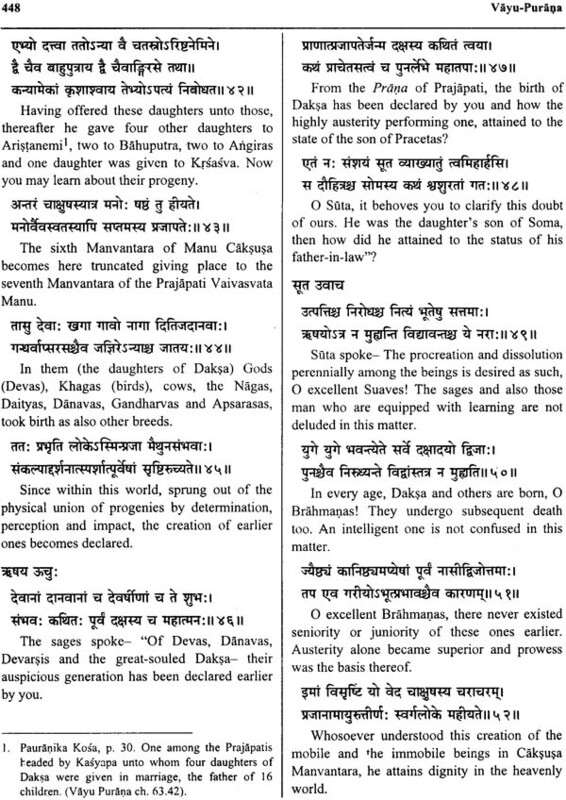 From Parasara it passed on to Jatukarna from Dvaipayana and from Dvaipayana, the sage, assimilated. According to Vacaspati Gairola, Vayu Purana consists of 12,000 verses in 112 chapters. He considers Siva Purana as who Distinct treatises even when Visva-Kosa-kara of Bangla takes two as identical, on the basis of his review of Venkatesvara Steam Press, Bombay and Anandasrama Granthavali Publication of Siva Purana. In every Purana, there is a mention of Sagra (creation). In this connection, the other of the description of earth, planets, constellations and the entire universe is almost same in all the Purana. 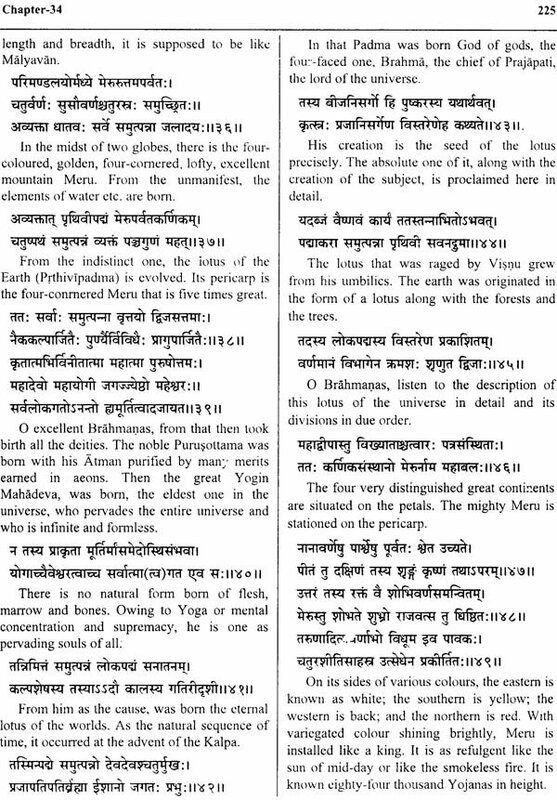 The narration of earth consisting of seven continents and seven oceans is also found in all the Puranas. Then, there is a also a description of sub-continents, their boundaries and their extents. 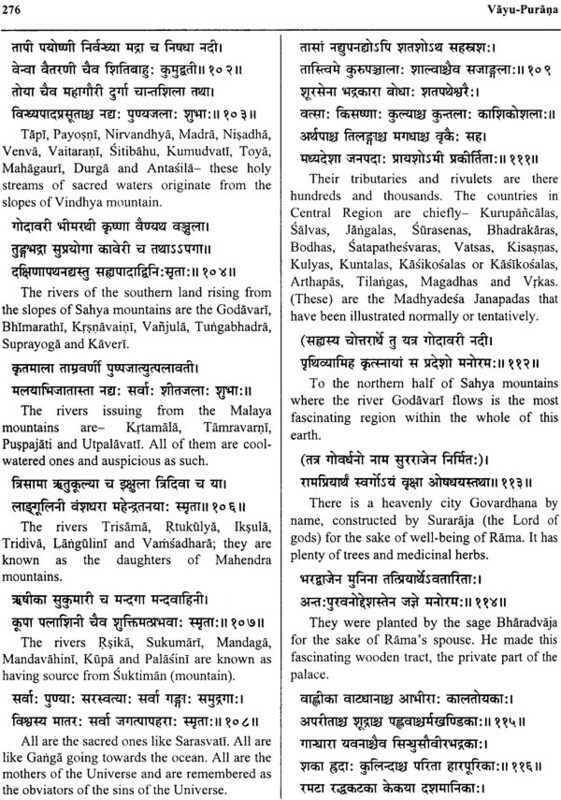 In Vayu Purana, there is a description of various countries situated at various locations on the earth. Also, we find brief narration about the people residing in those countries, their mode of conduct, nature, civilization, interests and geographical situation (mountain, rivers) etc. 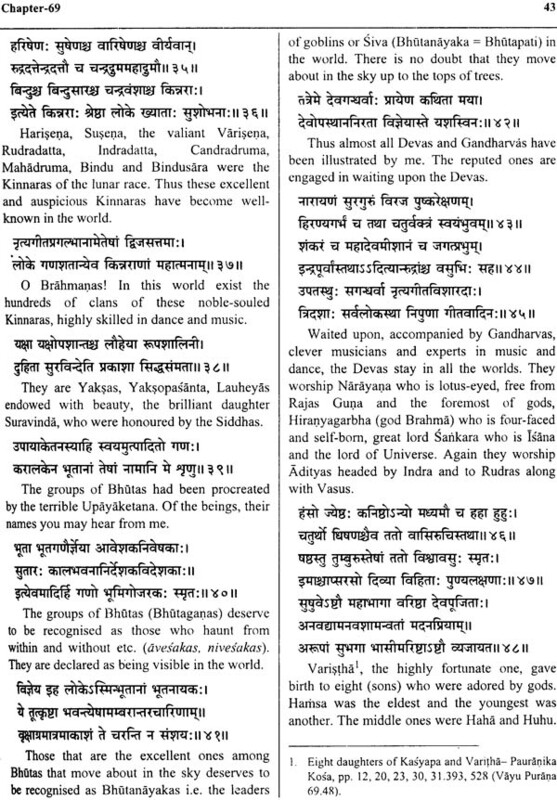 this Purana considers Bharatavarsa are named as Bharatas. There are nine division of this Bhratavarsa which are surrounded by oceans. The ninth division is said to have an extent ranging from Kumari island (modern KanyaKumari) to Gangotri (in Himalaya). The ancient perimeter of Bharatavarsa definitely differs from the modern one. By reading about the rivers, mountains and states of Bharatavarsa, we can have an insight of the geographical status of the great Bharatavarsa. The Vayu Purana is divided into four four padas-1) Prakriya Pada, 2) Upadghata Pada, 3) Anusanga Pada, 4) Upasamhara Pada. The Vayu Purana states that the Ultimate source is Mahesvara, who id four-armed, four-faced, Supreme, the Unmanifest, the inconceivable, the inscrutable and is the self-born God, from him, an excellent Golden, Egg was enveloped by the water, the waters by the fire; the fire by the wind; the wind by the ether; the ether by the Cosmic Ego; that Ego by the Cosmic Intellect (Mahat) and the intellect was enveloped by the Unmanifest (Avyakta). In this verse, thousands of sage have been mentioned as the dwellers of the gleam of Moon. The constellation are glorified by the shine of Moon and therefore, Moon is considered as the king of all and because of its extensive coldness, it is also referred to as Vipra (Brahmana). Indicates that the whole heave is a world in itself. Here is included all villages, towns, battle, sages etc. and all other are 88.000 sages in the heaven who used to listen the stories of Puranas from Suta in the Naimisaranya forest. In the same manner, the details of Ayodhya, Mithila, Anga, Kalinga, Kikata, are also full of Vedic and scientific meanings. The Vayu Purana also describers about the supreme powers of Yoga and Meditation and the procedure for attaining the ultimate emancipation. There is a indepth review of Kalpas, their numbers; luminary bodies, their calculation based on both divine and human methods; the arrangement of sun, moon and other planets; the cycle of four Yugas, their characteristics etc. there are a number of benedictory hymns in praise of Lord Siva. There is a detailed description about the abode of lords  Siva, Brahma and Visnu. Further, like Siva Purana, there is huge description on the worship of Linga (phallus-shaped image) of lord Siva. 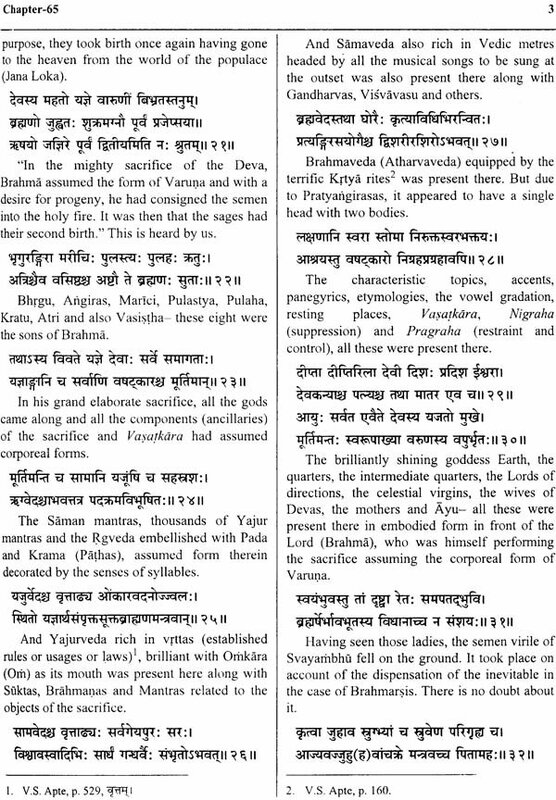 There is again a mention of the incident of description of Daksa's sacrifice by Siva. 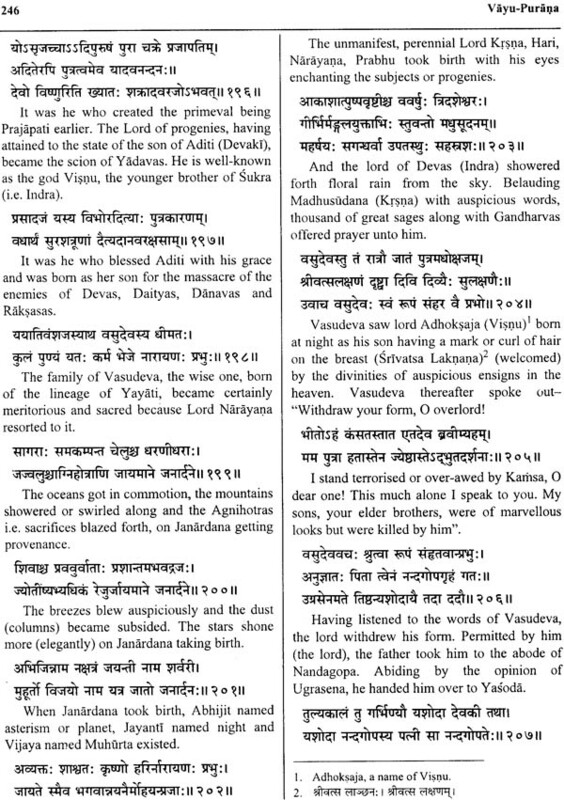 The Arbhanarisvara from lords Siva is also highlighted in the Vayu Purana. The unity, diversity and speciality of Brahma, Visnu and Siva are being enumerated. About lord Visnu and Vaisnavism, Vayu Purana depicts Visnu as omnipresent one of universal character, a protector promoting continuance. He is threefold according to Gunas, fourfold according to Vyuhas (His manifestations such as vasudeva, Sankarsana). He is the true proctor and hence 'Om'. He divides himself into three for the acts of creation, protection and destruction, respectively. 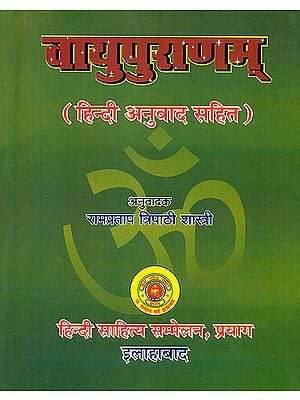 The salient feature of Vayu Purana is inclusion of two chapters numbered-86-and 87 on science of music, figures of speech and songs. 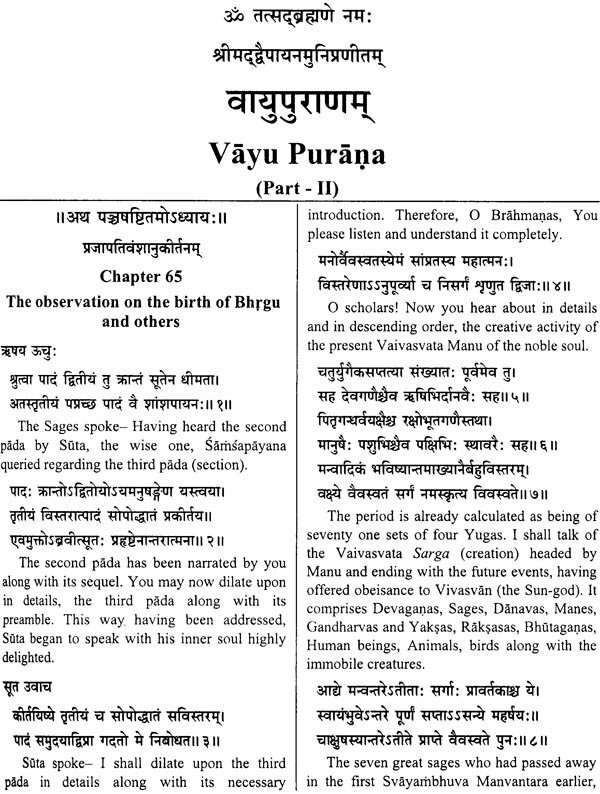 Vayu Purana also mentions about various schools of philosophy, viz. 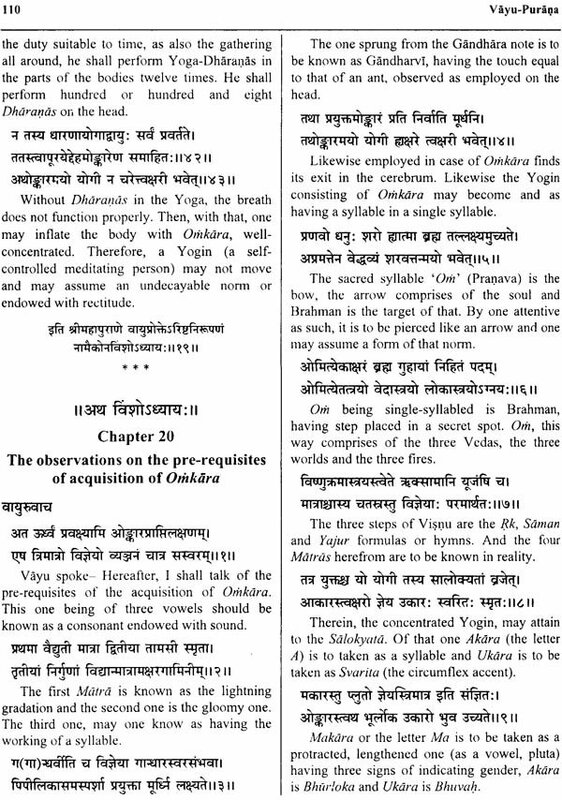 Samkhya, Vedanta and Yoga. There is also a brief description of various island (continents), rivers, oceans, holy mountains and places of pilgrimage with particular emphasis on Gaya tirth. Himavan (Himalaya), Hemakuta, Nisabha, Meru, Nila, Sveta and Srngavan- al these are enumerated as the Vrsaparvata. The sub-continents such as Bharata along with the rivers and the mountains as also having been habitated or inhabited by the beings both mobile as well as immobile, jambudvipa and other dvipas (islands or continents) are surrounded by seven oceans and likewise the earth endowed with the irrigatable areas or waters and the Lokaloka are described. The extent of the Sun, the Moon and the Earth in Yojanas with their present presiding deities. The sacred assemblies of Mahendra and others on the northern crest of the Manasarovara and above that is spoken off, the movement of the heavenly bodies like that of the fire-brand is also description. 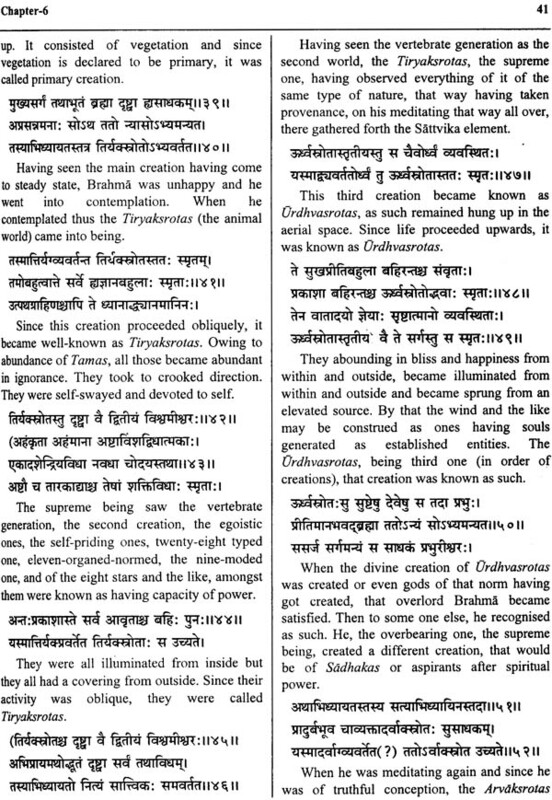 There is the enumeration of the outcome of the Prabhana (the Principal one) from Visvarupa (the Cosmic form), which is quite amazing. The creation of Daityas, Danavas, Gandharvas, Serpents, Raksasas, all the Bhutas, Pisacas, animals, birds, creepers, and the celestial damsels are enumerated, being many, in details and also the birth of the elephant Airavata created by the association of the ocean and the birth of the son of Vainata (Garuda) and his coronation (are also narrated). Three types of dissolutions of all living being, viz. Naimittika (occasional), Prakrtika (natural) and Atyantika (ultimate) is being illustrated. 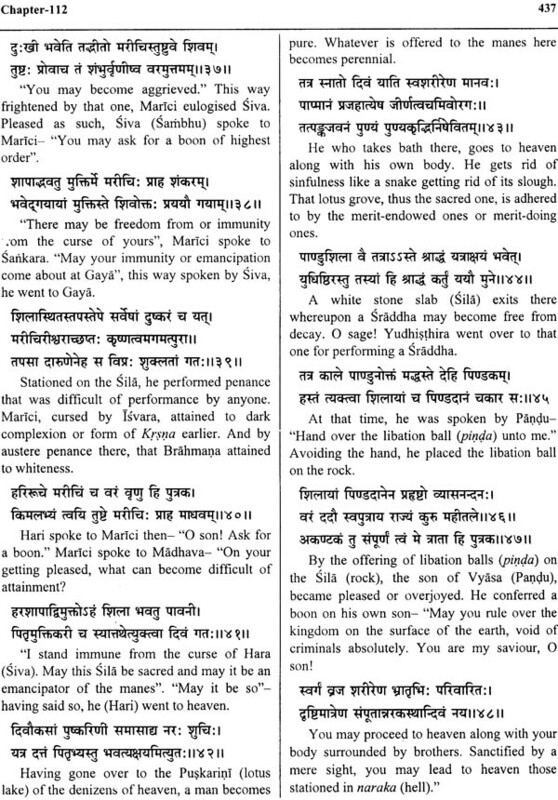 Then the description of the seven worlds such as Bhu and others is given and are enumerated the hells (or Narakas) of the sinister ones, such as Raurava and the like. The holy rites of sacrifice, Sraddha etc. are common in almost all Puranas, but Vayu Purana pay special focus not only on the procedure of Sraddha rites, but also the appropriate time for doing that, the benefits and merites after that as well as the correct places for performing the obsequial rites for different castes of society. The complete series of the different dynasties is found elsewhere only in the Vayu, the Nrahmanda (which is its counsin), the Matsya and the Bhagavata Puranas. The Brahma Purana, the Harivamsa, the Agni, Linga, Kurma and Garuda Puranas have lists of various extent, but none beyond the families of Pandu and Krsna. The Markandeya contains as account of a few of the kings of the solar dynasty alone; and the Padma, of a part of the solar and lunar princes only, besides accounts of individuals. In the Ramayana, Mahabharata and in the other Puranas, occasional short genealogies and notices of individual princes occur. The dynasties so described in Vayu Purana are (i) Barhadratha dynasty, (ii) Pradyota dynasty (iii) Sisunaga dynasty (iv) Nanda dynasty (v) Maurya dynasty (vi) Sunga dynasty (vii) Kanva dynasty (viii) Andhra dynasty (ix) Naga dynasty (x) Gupta dynasty there is a detailed mention about their past and future descendants and some tales regarding their great exploits. 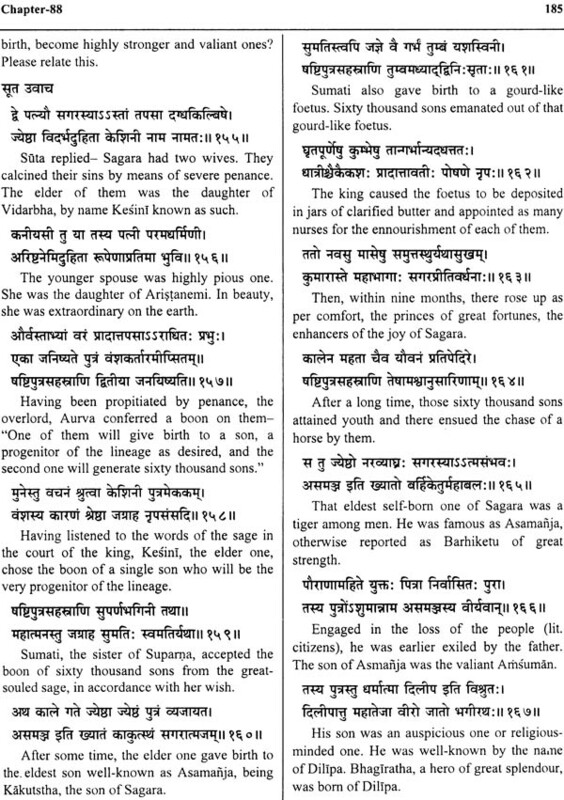 In its chapter 85-90, the Purana sums up, in the form, of genealogical lists, the account of the various ancient dynasties ruling in North India and occasionally narrates the incidents connected with these kings. Vayu Purana apart from being a storehouse of esoteric lores, scientific topics, is a fundamental measure of etymological derivations properly illustrated in annotations. 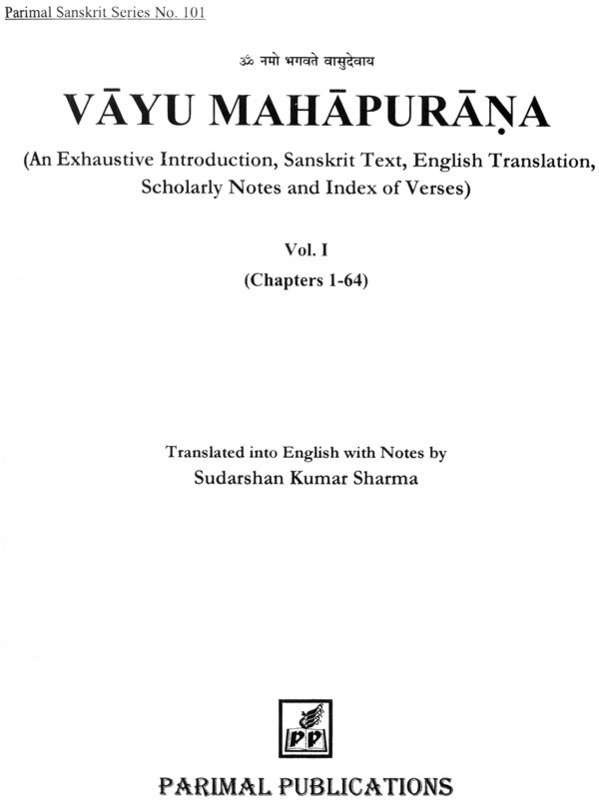 In preparing this english translation of Vayu Purana- Pauranika Kosa, Purana Visayanukramanika by Yashapal Tandana, published by Visvesvarananda Institute of Sanskrit and Indological studies with comparative allusive norms of Visnu Purana of Gita Press Gorkhpur, Bhagavata Purana of the same agency, V.S. Apte's Sanskrit-English Dictionary, Sanskrit-English Dictionary by Moniré Williams, Bahat Samhita of Varaha Mihira, Geographical Dictionary of Ancient and Mediaeval India by N.L. Dey, Historical Geography of Ancient India by Bimal Churu, A Study in Geography of Ancient and Mediaeval India by Dr. D.C. Sircar and Geographical Encylopaedia of Ancient and Mediaeval India by Dr. K.D. Vajpeya, R.N. Dandekar and others, have been consulted to evade any remissness. Through utmost care has been taken in bringing out this translation work, in case of any shortcomings, I shall request the esteem readers to know me the same so that they can be improved in the editions.